85% of Dry Eye Patients Have MGD — OcuSci Inc.
MGD is a common cause of dry eye. Have you been told that you might be suffering from MGD when you complain of eye discomfort? Do you know what it is? Do you know how to treat it? Well here's the skinny on meibomian gland dysfunction. The meibomian glands are arranged vertically along the eye lid. 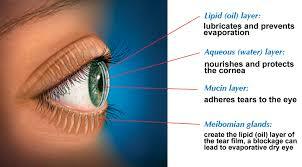 These glands release oils that maintain good tear coverage as the eye blinks. With gland dysfunction there is either to little or too much oil in the tear make-up. Early on MGD may go unnoticed but if its left untreated the glands can become blocked by thickened secretions. Chronically clogged glands are eventually unable to release any oils and results in permanent changes to tear make-up and chronic dry eye. Using a specially made eye compress is soothing and effective. The good news is that treating MGD is fairly simple and can be done at home in three steps. Step 1. Heating- Using a warm, moist compress for between 5-10 minutes a day will help dissolve the solidified oil that clogged the glands and increases oil secretion. Step 2. Massage - Apply light pressure with your index finger or a cotton bud to the lid margin near the lash line. Roll the finger upward on the lower lid while looking up, then roll the finger downward on the upper lid while looking down. Massage can irritate the eye if done too much; twice a day when the condition is acute but only once when symptoms decrease to maintain good eye health. Step 3. Omega-3 - Adding or increasing your daily intake of omega-3 fatty acids will help maintain oil consistency. There are many food sources of omega-3 but most Americans don't get enough, taking a triglyceride form supplement that provides high levels of EPA and DHA omega-3 has been shown to improve all aspects of eye health. Posted on October 8, 2015 by David McMahon.